Los Angeles, CA (April 11th, 2019)–Bob Arum’s Top Rank and ESPN will present a televised four bout card of boxing on Friday, April 12, 2019, at Staples Center in Los Angeles, California, featuring the 12 round main event title bout. World Boxing Association and World Boxing Organization World southpaw world champion Vasyl Lomachenko of Oxnard, California by way of Ukraine, will face a significant challenge from the former WBA World Lightweight champion Anthony ‘Million Dollar’ Crolla of Manchester, United Kingdom. Lomachenko will have to get past the roadblock on Friday Anthony Crolla presents, is he is to position himself into a mega payday super fight with Floyd’s fighter, southpaw Gervonta ‘Tank’ Davis, 21-0, the current World Boxing Association Super World Super Featherweight champion from Baltimore, Maryland. Within the past 24 hours, trash talk has been exchanged indirectly between Lomachenko and Davis through reporters and social media, starting a controversy reminiscent of Floyd versus Manny Pacquiao. Boxing experts have immediately begun predicted who would win if Lomachenko and Davis fight each other. If the money is right, Lomachenkoand Davis could be on the trail of a 2019 or 2020 super fight promoted by Floyd Mayweather Promotions and Bob Arum’s Top Rank, if both he and Davis can remain in the 130 pound weight class. Davis previously lost the International Boxing Federation World Super Featherweight title on the scales by two points in August 2017 before his title defense against Francisco Fonseca. The IBF world title belt is currently held by Philadelphia southpaw Tevin Farmer, who could also figure into a titular unification bout with either Davis or Lomachenko if they ultimately do not wind up fighting each other. Lomachenko, 12-1 with nine knockouts, is predicted to win by stoppage between rounds seven and nine. Crolla, 36-6-3, with 13 knockouts, lost decisions to Jorge Linares, a recent first round knockout victim who was subsequently stopped by Lomachenko. Crolla has recent wins over Ricky Burns (Win 12), Edson Ramirez (Win 10), and Daud Yordan (Win 12), fights with a combined record of 68-6-1 when he fought them in 2018. Crolla certainly deserves his opportunity shot against Lomachenko, but with all factors considered, the bout still does not figure to go the distance. Crolla has considerable ring experience, should still give a good accounting of himself, and put up a valiant effort to try to win anyway. In the preliminary bout to the main event, Gilberto ‘Zurdo’ Ramirez of Matzatlan, Mexico, the World Boxing Organization World Super Middleweight champion moving up in weight, is expected to win his light heavyweight debut by 10 round decision over 29-6-1 southpaw Tommy ‘Kryptonite’ Karpency of Adah, Pennsylvania. Karpency holds a 10 round decision win over former WBC World Light Heavyweight champion Chad Dawson, and decked current WBC World Light Heavyweight champion Oleksandr Gvozdyk in the first round of their 2016 NABF regional title bout. Karpency could give Ramirez some trouble as it is a new weight class for Ramirez. Ramirez should win by late round stoppage. Ramirez joined a number of champions and contenders moving up in weight class for various reasons, such as David Lemieux moving up from middleweight to super middleweight to super middleweight to fight John Ryder at T-Mobile Arena in Las Vegas next month. Going up in weight class is trickier and far more difficult than fans can imagine. Despite the reputation and abilities of the fighter, it does not always work. The Old Mongoose, the late Archie Moore, dominated the light heavyweight division as world champion, but failed twice to win the world heavyweight title from Rocky Marciano and Floyd Patterson. Moore felt he was capable of making the transition to the higher weight class, but had insufficient time to make the weight adjustment. 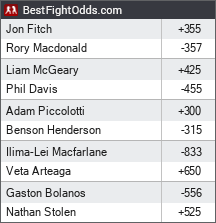 Perhaps, if marquee fighters allowed themselves the opportunities to start from the beginning in each weight class, they could work themselves up to contention in the new division. Promoters do not operate that way, and name fighters are always thrust into money bouts against name opponents, such as World Middleweight champion Kelly Pavlik versus Bernard Hopkins at light heavyweight. It didn’t work. 40-4 former WBO World Welterweight champion Mike ‘Mile High’ Alvarado of Denver, Colorado, is predicted to win by 10 round split decision over 20-0 welterweight prospect Arnold Barboza Jr. of Long Beach, California in a close bout difficult to score which could go either way, depending on upon which version of Alvarado shows up. 5-0 super lightweight prospect Jose Rodriguez of Indio, California will open the card, and is favored to win by third round stoppage over 3-3-1 Ramel Snegur of Portland, Oregon.